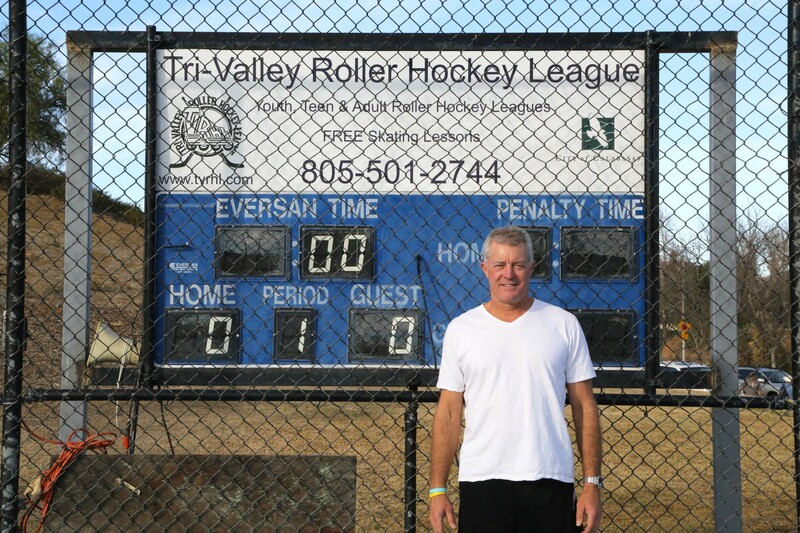 For 17 years, Ned Collins (above) has organized the Tri-Valley Roller Hockey League at Juan Bautista de Anza Park in Calabasas. Currently, he single handedly runs nine divisions with practices and games on Tuesdays, Thursdays, Saturdays and Sundays. At the moment, the league holds about 350 total participants with 120 of those being a part of the youth program, according to Collins. They play year-round with a special summer evening game schedule since it’s too hot to skate in pads in July and August. Collins typically refs 21 games per week, and enjoys every second of it. In the 80-degree heat, 10 children skated around on a blue rink with parents and spectators cheering them on. Collins served as the referee, encouraging and directing the players. The Yahoos ended up winning, 4-2. Rosekrantz also emphasized how the teams played clean hockey. This isn’t the National Hockey League where skaters drop their gloves to throw punches; this league focuses on the pure joy of the sport. “My favorite part is having fun,” Yahoos team member Sean Jarecky said. Shortly after the Yahoos and Penguins game, two more teams took to the rink to finish out the day: the Capitals and the Maple Leafs. This one went into overtime and then sudden death (or “sudden life,” as Collins called it). The Leafs edged out a 7-6 win over the Captials. Capitals team member, Owen Buckholtz, mustered up a smile following the tough loss, and shared what he enjoys about playing: “My favorite part is scoring goals. I like to meet friends, and I work my hardest. I love hockey. My dad taught me how to play when I was just a small baby.” His mom, Danielle Marin, chimed in about how she’s “super proud” of her boy in his athletic and academic achievements. Penguins’ Harry Martin (left) and Capitals’ Owen Buckholtz (right) after the games concluded. 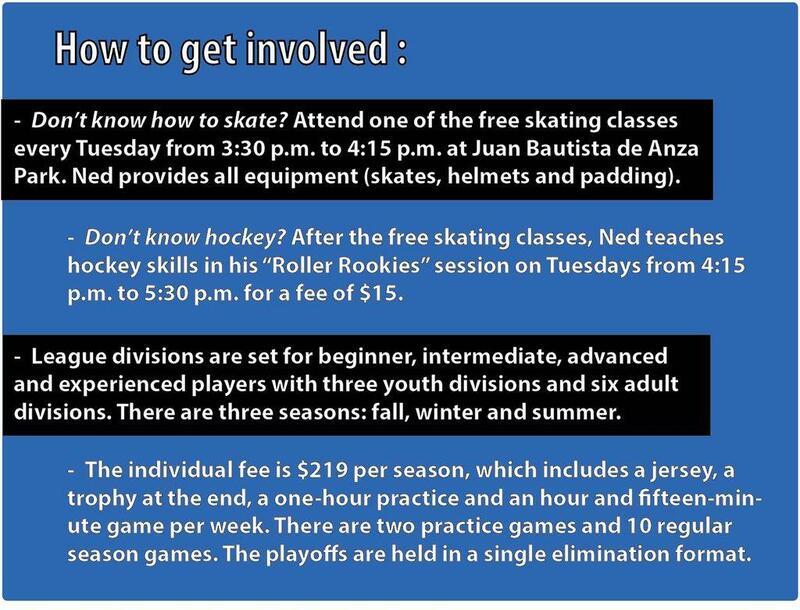 In addition to providing the youth with a means to have fun and be active, the roller hockey league gives participants the opportunity to build camaraderie and make new friends. For Ethan Karpel, the 2013-14-winter season was his first experience with the sport. The first thing he mentioned was how he met his best friend on the team. “This goofball,” Karpel said pointing at teammate, Andrew Edelstein. Another player, Harry Martin, said his family moved to Simi Valley from New York last year and that this league has helped him make a lot of friends. Martin still skates on ice at the Iceoplex near his house in Simi Valley. His stepfather, who also coaches the Capitals, drove him to Calabasas for his game on Jan. 18. The family and friends values that the league encourages are especially appropriate considering how it was initially founded back in 1985. 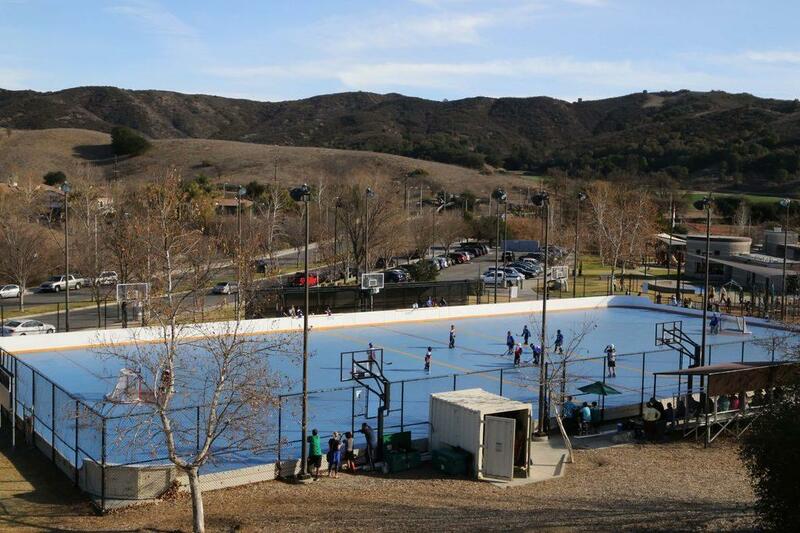 The rink at Juan Bautista de Anza Park in Calabasas. Then, the other Collins brother, Ric, who owned an Encore Sports in Thousand Oaks, built up a league in West Valley. Both leagues grew rapidly successful, especially with Wayne Gretzky arriving in Los Angeles in 1988. Despite not having any substantial skating experience, Ned agreed to join them. “We would go out and set up at 4 a.m., and play from sunrise to sunset,” Ned said. He left Simi Valley for Calabasas after he received another phone call — this time from Calabasas facilities director, Greg Johnson. Johnson offered Ned a rink to rent — and this one had lights. Today, Ned stands as the only Collins brother involved in the roller hockey league. Three years ago, Walt left Encore Sports and now owns Consignment Sports in Thousand Oaks, and Ric is running a paddle boarding business in Malibu called Hana Paddle Boards, according to Ned. 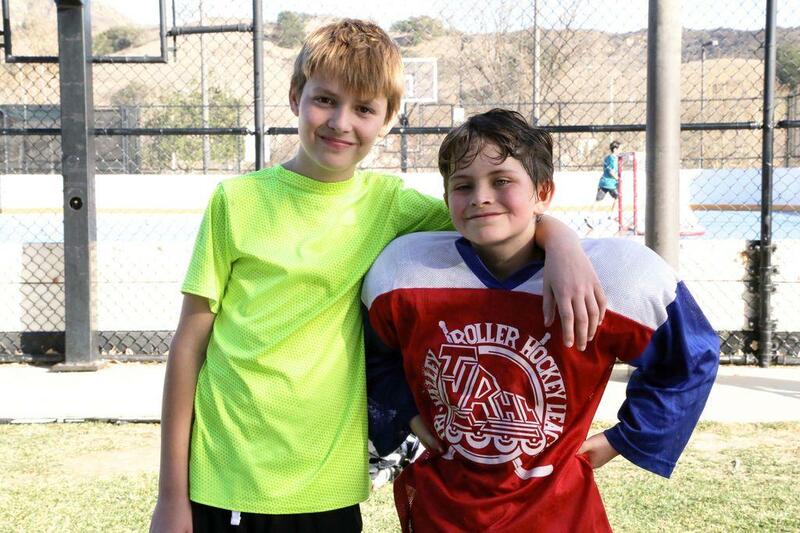 Ned organizes and directs the entire Tri-Valley Roller Hockey League operation in Calabasas — from holding free skating classes to refereeing games. For the Tri-Valley League’s contact information, go to tvrhl.com. All photos and video by Alysha Tsuji. First published on Jan. 22 on the Graphic Online Daily website.